Get your kids hooked on books, develop preschool reading skills and ignite a love of literature, a desire to learn to read and enhance reading comprehension by reading with your kids. The ability to read is an essential skill for learning, and if a child loves reading, she will become more skilled at it. This lifeskill will give her an advantage: She will gain not only knowledge, but also pleasure from the literature that she is able to read. The converse is also true. A child who struggles to read, will struggle with conventional forms of learning and will always be frustrated when required to read. This could lead to all sorts of related problems which in turn may affect the child's self esteem and behaviour patterns. Of course you want to prevent that scenario, so where and when should a parent begin to develop preschool reading skills and teach their child to learn to read? As soon as your baby is old enough to sit on your lap and read a book with you, you should begin developing preschool reading skills and getting her hooked on books! At this age your child is learning all sorts of things at an amazing rate and so you can use this time exploring books to create a good first impression, which will never be erased! Even before she can speak, your little one can learn that reading is a time to cuddle up on your lap and spend precious moments together with you having fun and exploring the images in the books you share. Babies learn by experience, so let the time you spend developing preschool reading skills become a touching, feeling, looking and listening experience. Obviously, you don't want your prize books to undergo the taste-test or get ripped apart, so keep them for use under supervision, but do let your child play freely with board books, cloth books and plastic bath books. As she grows older, she will realise that these things get paged from one side to another, that the images have to be the right-way up and that recognizable objects can be represented by two-dimensional images on a page. She may still be far from the maturity required to read, but she is already developing essential pre-reading or basic preschool reading skills! 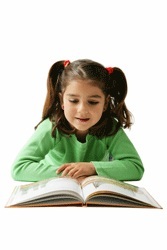 Your little tot will learn about reading even faster if she has good role models. If she sees you or other family members enjoying books, she will soon copy you when you sit down with one of those booky things! However, remember that initially a book will be just another thing to your child, so expect some damage and limit her contact with books to the sorts mentioned above, but do begin to teach her to handle them carefully and praise her for her efforts. Family photo albums and books with real photographs such as those published by Dorling Kindersley. Touch and feel books that have parts that are textured or scented. Pop-up books that require manipulating flaps and moveable parts. Squeaky books and books with holes in the cardboard pages. 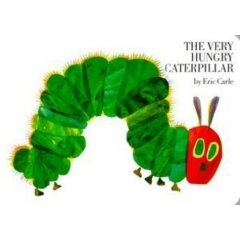 The Very Hungry Caterpillar by Eric Carle is a lovely, holey book! Click here to read about fun lapbook activities based on this story book on the Printable Crafts page. It's an exciting moment when your child recognizes and names a picture in a book for the first time! Her cognitive and linguistic skills have reached the point when she can begin to play naming games. This is not only fun with books, but she has learnt that images in books convey meaning. There are plenty of books that are aimed at just this naming stage - animal books, books about food, transport, alphabet picture books, baby's first picture book, etc. From a young age, you should regularly read nursery rhymes and poetry to your children. Poems and rhyming verse will help to develop your child's listening skills as words are used to paint pictures. These are also preschool reading skills. There are many other Benefits of Nursery Rhymes. As you and your child share more and more books and as your child matures, she will start to learn that you read a book from front to back, that you read the black and white 'thingies' that are printed on the pages, that you read from top to bottom and from left to right, that the printing is words and that the words convey pictures and meaning. They will also learn that stories have characters, action, a plot, a beginning, middle and an ending. These are all important pre-reading skills, which are required before other reading skills can develop. After large quantities of time spent together reading books, your child should get hooked on books! Click here for part two of this series: Preschool Reading Together - opens in new window. Take a look at some of Shirley's children's and her favorite books, DVD's and toys!